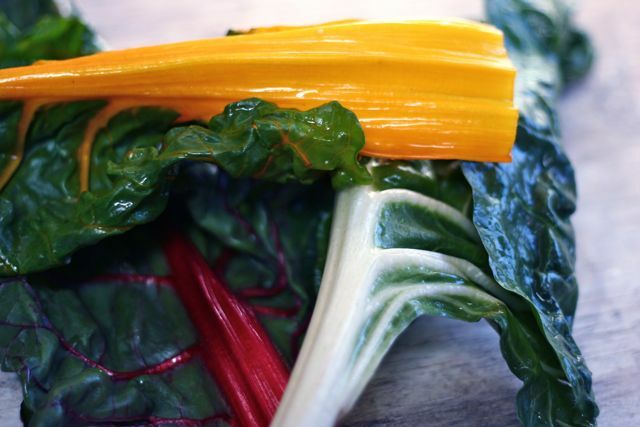 There were no winter greens at our house when I was growing up, let alone rainbow chard. Winter vegetables were frozen – peas, limas and string beans dominated the supper rotation, since fresh green vegetables were hard to come by during Pennsylvania winters. Like many kids, I dutifully chewed the mandatory “three bites” and then eagerly turned to the rest of my plate. Having lived in California for over 30 years, you would think I would have discovered winter greens such as rainbow chard ages ago. Our local farmers markets are loaded with beautiful kale, chard and other leafy winter greens. Even the supermarkets are selling more and more winter greens once the weather begins to cool. My friend Lynda turned me on to kale chips last year, and the “green potato chips” won Larry’s heart as well. So, my romance with kale is only a year or so old, but these days I have begun flirting with Swiss chard. I’m crazy for the rainbow chard that I find in our farmers markets. I’ve learned to ignore recipes that instruct me to cut out and discard those beautiful center ribs. Just chop and sauté these little jewels a few minutes longer than the leafy greens. Larry will eat almost anything that has plump raisins tucked into it and is studded with toasted cashews. Almonds would work here too, but I had a bag of cashews in the freezer and “Eat Your Greens! 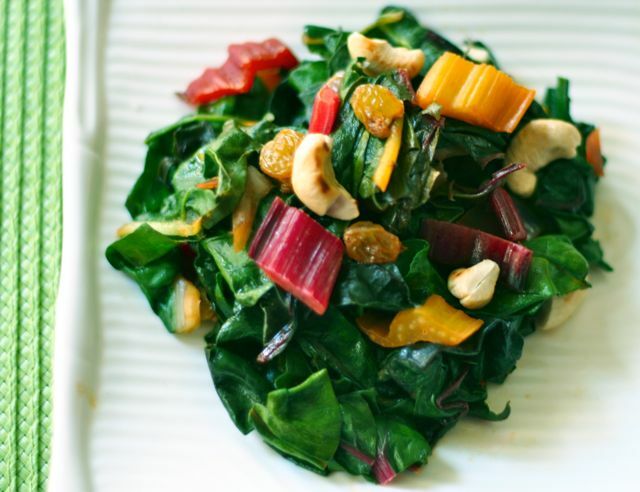 Rainbow Chard with Raisins and Cashews” came to be. TIP: Use a small skillet and no oil to toast the cashews. Watch carefully to avoid burning them. Your nose will alert you, so “listen” to it. 1. Using a small skillet, cook the cashews over medium-low heat, stirring, until toasted, 3-5 minutes. When cooled, roughly chop and set aside. 2. Take the chard and remove the center ribs with a sharp knife. Cut the ribs into half-inch pieces and set aside. Coarsely cut the chard leaves and set aside. 3. Using a large heavy-bottomed pot, heat the oil. Add the chopped onion, paprika and chard ribs and cook over medium heat for 5 minutes. 4. Add the chard leaves in batches, cooking and stirring until wilted, about 3 minutes. Season with salt and/or pepper to taste. 5. Add the raisins and the stock, cover and cook over medium-low heat for 5 minutes, stirring occasionally. 6. Drain the chard and transfer to a serving dish. 7. Drizzle chard with the vinegar and maple syrup. Toss. Top with toasted cashews and serve. This is a fun Blog Hop that I joined, thanks to my dear pal Susan, who is a host for this month’s theme, #Greenslove. What a beautiful, colorful dish! I love the additions of cashews to this. We made a rainbow chard stuffed pasta the other night – it’s such a yummy green! Liz this looks so good! I love the big golden raisins in it. You’re so sweet to let me link on your site – X0 – love the new blog name too. The surprising ingredients in the this dish are the paprika and maple syrup. Sounds great. Always looking for new ways to do greens. Love the color as well. I wanted the paprika for some smokiness and the maple syrup and vinegar for a sweet-sour touch. I love chard! I agree with you that the lovely stems are just as good. Chard is grown in the summer here so I will remember this for when I have my glut in a few months. We have lots of greens recipes, since we are growers. What a delicious use of chard! Wonderful – glad to discover and “like” your facebook page. This recipe looks fantastic. Healthy ingredients + a variety of flavors and textures = delicious. P.S. Tell your friend Susan I’m available for encouragement on her vegetarian quest! Sure, Nancy – thanks for stopping by. Gorgeous, I love chard and am with you on not discarding the colorful spine. What do you think about using dried cranberries instead of raisins? Love your idea about cranberries – prefer to the raisins for certain. I asked because I am not fond of raisins. Going to make this with the cranberries, great recipe. Liz, that dish is so colorful and inspiring. I fell hard for chard this year, too. Lovely post! Lovely recipe. The raisins sound great with the chard. wonderful salad especially with the touch of toasted cashews. 🙂 i haven’t had swiss chard in awhile. this might be my inspiration! The blog hop is so fun – thanks for all your efforts. Wonder what our theme will be for April? Asparagus? Strawberries? We ate mostly sauerkraut, radishes, and frozen spinach in the winter, but in spring and summer there was always chard (and sorrel:) It is the best vegetable to plant, because it just keeps on giving: the more you cut, the faster it grows. I love it! First of all, I love your photos!!! They are so colorful, they just jump out at me. Great job. And I love this recipe. I’ve been so busy this week, I haven’t been able to spend much time in the kitchen – or online. Raisins, or anything sweet is so wonderful with chard, and the cashews would add the perfect crunch. Sending you lots of #greenslove, girlfriend! This is a lovely salad perfect as a side dish. Visiting from greenslove bloghop! Hi – Now I will visit your site! Ha – I liked my verb too. This sounds and looks delicious. I love the addition of the maple syrup and vinegar…yum, I can taste it now. Liz, this looks delicious! Perfect for my vegetable craving that I seem to be experiencing non stop. You should enter this in the F52 maple syrup contest. The addition of the maple syrup is genius. I love the tang it adds.